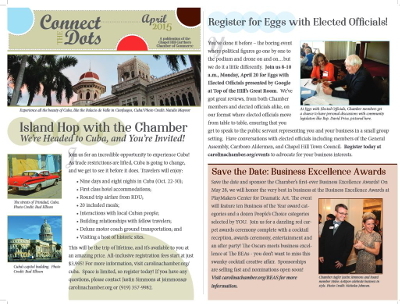 Subscribe to receive Chamber digital and print publications, including Membership Matters and Connect the Dots, as well as action alerts with important community news. Contact Rebecca Dickenson at (919) 357-9990 to advertising in Chamber digital and print publications. Share your news with Chamber communications manager Amy Grau and explore together how to get the word out more widely. "The Chamber provides a critical resource for our community, an open space to share and exchange ideas about issues that impact us all. Our vision for the future is shaped by the conversations of today. The Chamber's staff puts these words into action. They are open armed ambassadors to the sustainable, inclusive, and dynamic community we all desire."